The Polar Vortex descended on the free folk of Middle Earth early Monday, to the tune of six degrees below zero. (That’s a negative 21 degrees on the Celsius scale if you’re interested). Six degrees below zero is one thing but negative six with a 30 mph wind in your face was brutal. This is exactly what Saruman the White did to the Fellowship while they were going over the mountain pass of Caradhras. Like Boromir said: ‘”This will be the death of the Hobbits if we stay!” We all know Peter Jackson couldn’t say in the movie “IT’S A POLAR VORTEX!!!!!! !” It was bad out…real bad. Probably the worst I’ve ever felt in 27 years of construction. I mean it felt like an ice pick was going into your face when you were in the wind. We had gusts of over 60 mph in Queens which rendered the crane inoperable. ( For those of you who are interested the crane is supposed to shut down when winds exceed 35 mph.) We shut down at noon on Monday. Tuesday it was a balmy 22 out and it felt like we were in Jamaica. So my wife says Christmas week: “We really have got to get rid of that pumpkin.” Or maybe it was: “We are the only people in the state of New York who still have a pumpkin out. Make sure the boys get rid of it this weekend!” I came home one night and the pumpkin was gone…I really didn’t think much of it. I go to work when it’s dark out and I get home and it’s dark out. I just figured they put it in a bag and went to the dump with it. You’re never gonna guess where these geniuses threw out the pumpkin. I mean we have almost 3 acres of property and tons of woods behind our house. Look where Terence “The Formerly Good ” threw out the pumpkin!!!! That’s our driveway in the foreground! You can see this thing when you drive by our house! You can see this thing from our window! 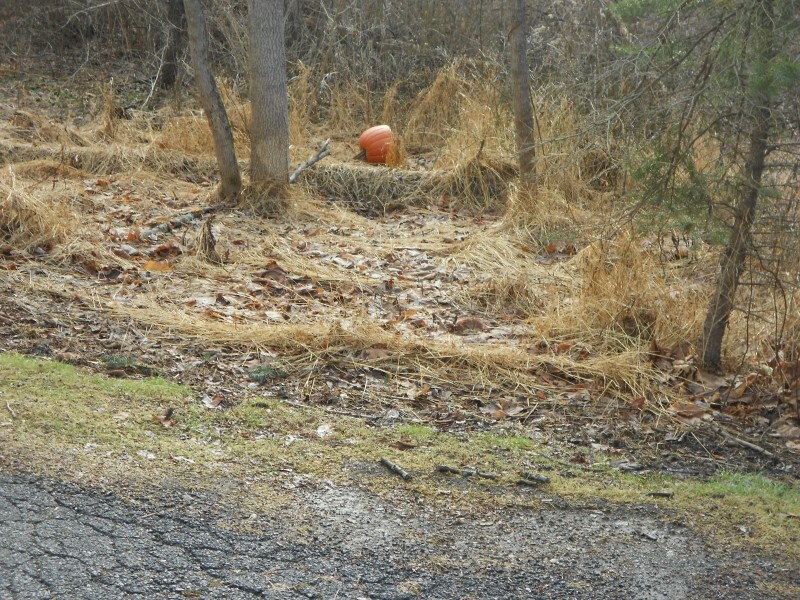 I was like, and I quote “Who in the hell threw the pumpkin out on the damn driveway!” Terence replies and I quote:”What???”. What???? I mean you’ve got to kidding me right? The town health inspector is gonna wind up stopping by saying we can’t have open trash pits on our property….and technically that’s not even our property. Terence the Good just dropped down a couple of notches. You can’t make this stuff up. Well the forecast for Saturday was rain all day and 60 degrees. I mean this weather is more than bizarre. So I was hoping that the rain might hold off til later in the day and I might be able to get something done. The weatherman said the heavy stuff was supposed to be later in the day. When I got outside it was raining lightly and I had let the boys know that if it wasn’t nice out we would cancel for the day. So I left a note and off I went. It came down pretty hard and then let up when I got to the house. I figured I would clear the snow off the roof and put some tarps down over the roof and maybe I could get some of the minor details done under the roof without getting soaked….and so I began. Ethan called and said he wanted to get a couple of hours in along with his friend Egzon. It wasn’t raining out so I said sure. It actually worked out really well. 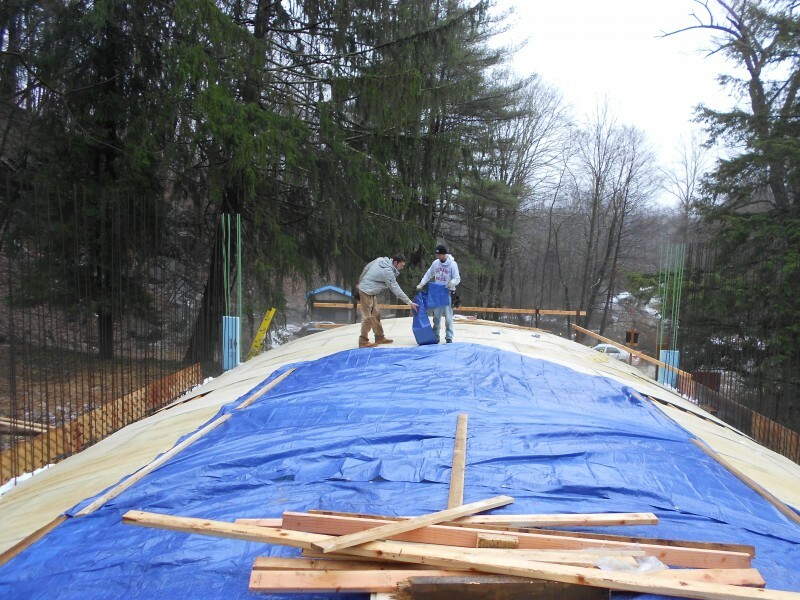 We put most of the roof decking down and then put three tarps over everything. Here they are. Tarping over the roof for working underneath. So after nailing the tarps down I set the boys up underneath. I forgot to take a picture but I’ll briefly explain what has to be done. First we have to remember what we are involved with here. Lots of weight is the bottom line….and a chain is only as strong as its weakest link. So basically the boys are shoring up the weak links under the roof deck. What does that mean? Well the plywood templates that we installed vertically can hold a lot of weight but there is the possiblity, however unlikely, that the larger pieces could buckle under the weight. This would or could lead to a catastrophic collapse of the whole decking system. We definitely don’t need that happening. So back to finishing the spandrel. If you remember I said last week I came up with a couple of ideas as to how to frame the balance of the spandrel deck. So I got to work on this once we finished upstairs. I don’t know if anyone is wondering if what we’ve done so far looks a little unfinished? You know the front and the back. Well hopefully these next set of pictures will help you understand how we are actually going to make this thing look good. Last week I took some time to cut out what I needed. There are quite a few steps here so just follow along if you will. 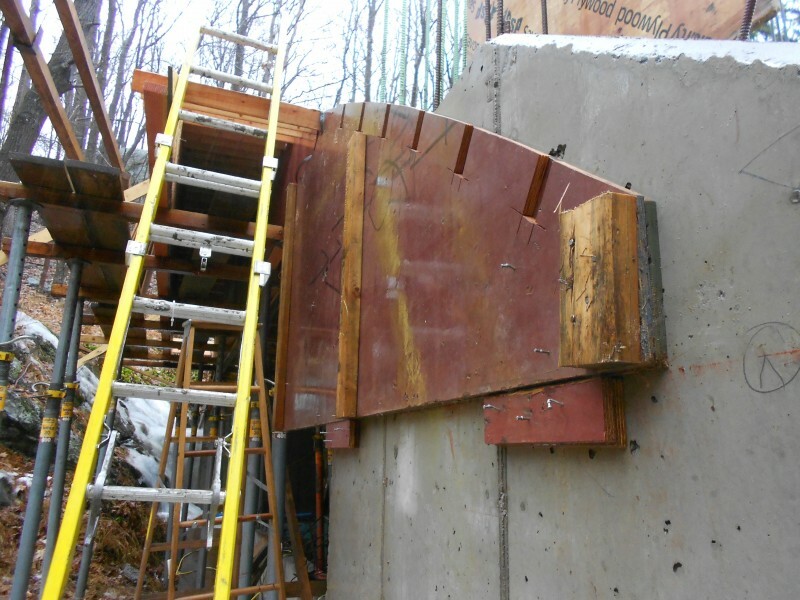 Step one was to set this first piece of plywood and secure it to the existing retaining wall in the right location. 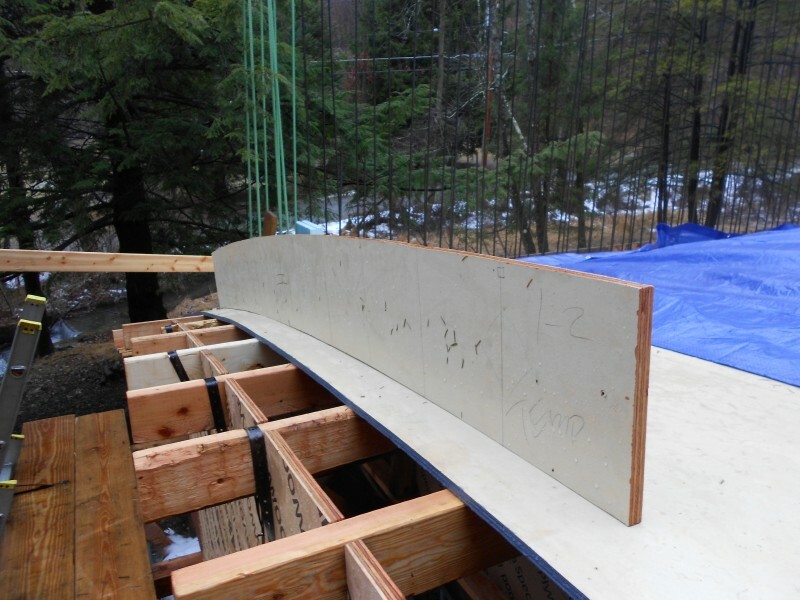 This piece will also act as a form for the concrete that will be poured on top of the retaining wall as well. This is why there are no notches for 2x4s in it. Check it out. Just one thing I forgot to show you. I wanted to check out the spandrel that I cut the previous week on the actual deck to see if what I did worked out. Here it is. 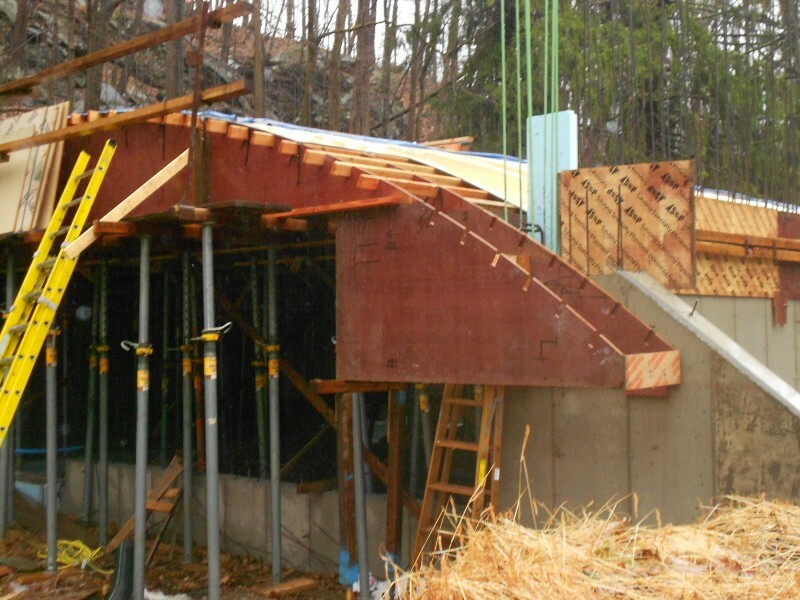 Check to see if the spandrel fits properly. Checking this is important because you don’t want to cut out the balance of the spandrels if the the templates are way off. This looks good though. We shouldn’t have any problems. The skew back will hide any minor imperfections when we install it. You’ll see. 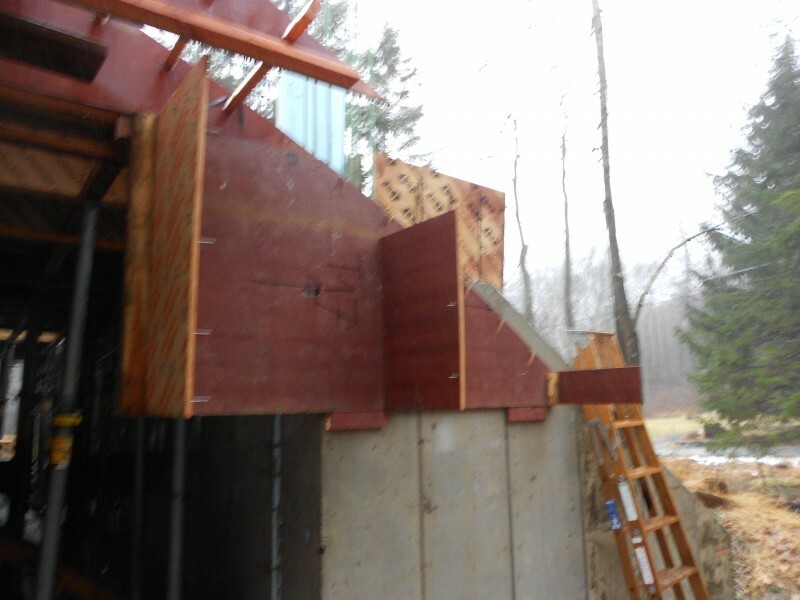 Getting back to the spandrel framing. Step two is to add another layer of ply to what we just installed. This one has notches for the 2x4s. This is how we’ll nail the decking to it. It also has vertical 2x4s nailed to it so we can nail a plywood spreader at these locations so we can “hang” the final template off of the spreaders. Second piece installed directly over the first. Add the plywood spreaders next. Now we add on our last template. It started to rain really hard at this point so we wrapped up after this. This next picture shows what I did but includes the support system as well. At each one of these locations we are going to have to put three short stringers supported by two legs. I only had time to put one in though. Check it out. Almost done. 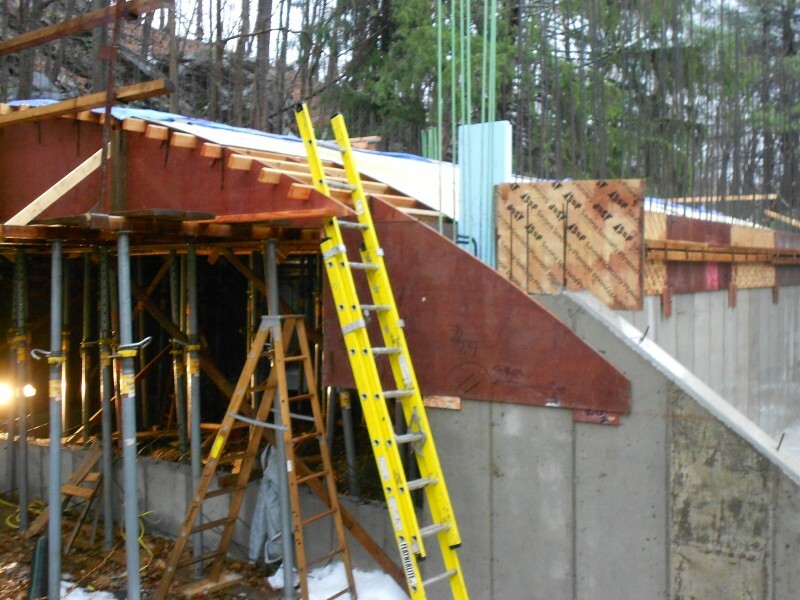 Corner spandrel taking shape. That’s all we had time for. I’ll take a better picture next week if we get good weather. This is how we make the transition at the retaining walls. Tedious but necessary. Oh yeah, and if you have a pumpkin you want to get rid of just stop by and drop it off! One more thing. Another Terence quote: “Time stops when the temperature reaches zero degrees Kelvin. “My response: What??????????????? Any astrophysicists want to explain that one to me? That pumpkin story is classic! I’m still laughing. Mike: The best part is that he’s looking at me like I have two heads. I’m not kidding! Thanks for writing! Talk to ya!